Many facial cleansers contain ingredients that can dry and irritate skin, making them too harsh for delicate, sensitive or acne-prone skin. Selecting the best cleanser may be easier than you think. Surprisingly, many plant-based oils offer a simple yet effective way to cleanse while hydrating and nourishing skin. The antiseptic, antibacterial and anti-inflammatory properties of Olive, Almond, Castor and Coconut oils make them a perfect choice to naturally balance skin pH, repair dry, flaky skin and restore a radiant, healthy glow. Nutrient-rich and deeply moisturizing, these oils bind to impurities and dissolve them without drying the skin. Not only do they lubricate skin, they also protect and renew skin health. Blending in a drop or 2 of your favorite essential oil, like Tea Tree, Lavender, Peppermint or Rosewater Blend, can add another dimension to your facial cleansing oil formula. These essential oils have astringent and antibacterial properties that work to minimize excess sebum, reduce redness and balance skin tone. Here are some suggestions for formulating your own combination of oils for a personalized facial cleanser. These ratios may be adjusted depending upon your skin type. Typically, if you have dry skin, prepare a formula of 1/3 Castor Oil to 2/3 Almond or Olive oils. If your skin is Oily, use a ratio of 2/3 Castor Oil to 1/3 Almond or Olive Oil. Add a drop or 2 of essential oil and watch your complexion glow. Mix your oils together thoroughly. Pour a small amount of the oil mixture to fill the palm of your hand. Rub hands together then rub into face, making sure to massage for a few minutes, allowing the mixture to penetrate the pores. Dampen a washcloth with hot water, making sure to ring out excess water. Place dampened, warmed cloth over your face. This will cause a steaming effect. Let the warmed cloth lay over the face for several minutes. After several minutes, use the same cloth to wipe off the excess oil. Pat face with a dry cloth and voila! Clean, nourish and moisturize at the same time! Pampering your skin with these organic and cold-pressed oils will keep your skin looking radiantly ageless. Create the special formula that works for you. This entry was posted in Natural Products, Organic Products, Skin Health on November 12, 2015 by Dr. Bruce Baar. Baar Balm is specially formulated with all natural ingredients that work together to soothe and protect the skin’s surface. It works great on minor cuts and abrasions, hives, dry, chapped skin, insect bites, minor burns and other skin irritations. 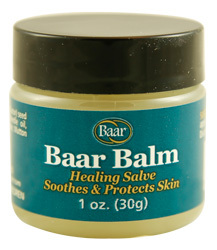 Baar Balm is made with the healing power of Castor Oil with the addition of soothing Menthol, Eucalyptol, Pine Needle oil, Camphor, Clove oil and Methyl Salicylate in a natural base of Mutton Tallow and Beeswax. Iodex with 4.7% iodine, has been available since 1910 and has been a trusted part of the family home medicine chest since then. 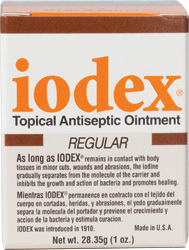 Iodex promotes healing painlessly through the slow release of iodine and does not cause any stinging or burning when applied. As long as this salve remains in contact with body tissues in minor cuts, wounds and abrasions, the iodine gradually separates from the molecule of the carrier and inhibits the growth and action of bacteria. 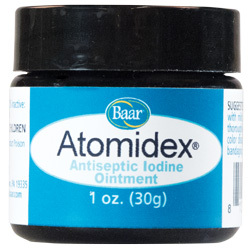 Atomidex® contains 2% Iodine, which acts as an antiseptic when applied to minor cuts, wounds and abrasions. Iodine has long been in use as an antibacterial agent and a skin disinfectant. Discovered in 1811, Iodine gained widespread popularity during the American Civil War, where it was used liberally to treat the wounds of soldiers. 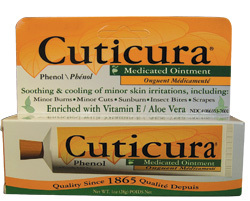 Cuticura Ointment is the original formula enriched with Aloe Vera and Vitamin E. This world renowned ointment (since 1865) is helpful for temporary soothing relief of pain and itching associated with minor burns, sunburn, minor cuts, scrapes, insect bites and minor skin irritations. 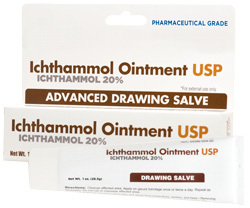 Applying a first aid ointment as the initial line of defense may help to promote faster healing of a wound. While there are many first aid ointments and creams available today, it is important to choose one which covers all the bases and suits your needs. 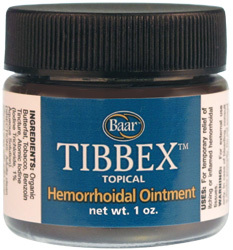 Have you tried and had great success with any of the above first aid ointments? Please share your healing experiences with us! This entry was posted in Skin Health on September 15, 2015 by Dr. Bruce Baar.